23 year old Anshula Mishra is a resident of Vaishali, Ghaziabad. She was born with physical deformities and visual impairment. Her father is a photographer and mother is a homemaker. Anshula also has an elder sister who is married. When she was 3 years old, Anshula’s parents took her to AIIMS, Delhi where the doctors diagnosed her of Retinitis Pigmentosa, a condition that results in gradual vision loss. Unfortunately the doctors didn’t guide the parents towards any rehabilitative course of action. As a result, they remained absolutely ignorant and worried about the future of a disabled girl child. Anshula was never sent out of the house for any formal education because her parents became over-protective given her gender coupled with disability. Seeing her completely dependent on the family for basic needs even at the age of 10, Anshula’s sister convinced the parents to send her for rehabilitation. 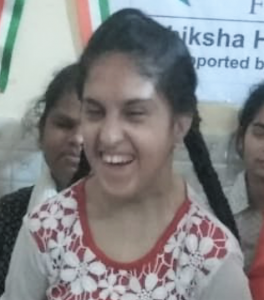 They admitted her in Interact Society in Noida where Anshula underwent two years of rehabilitation training but when the conveyance facility offered by the institute was withdrawn, the parents decided to keep Anshula at home once again. They felt that Anshula didn’t show any visible signs of improvement in the two years. Her parents were not prepared to send their visually impaired girls alone anywhere, so they decided to teach her some basic alphabets and numbers at home. Things turned worse from hereon. Anshula was confined at home for the next ten years, totally dependent on her parents for daily living. She required help for eating, bathing, dressing up and so on. No exposure to the outside world or any formal education left her addicted to Television. In 2018, Anshula’s sister found out about Eyeway on the internet. She called up the helpline and narrated her younger sister’s story to our counselor. After comprehending the entire issue, Eyeway counselor suggested the need for immediate rehabilitation so that Anshula could become capable of doing her personal work. This would help her regain the self-confidence that she’d lost over the years. The counselor recommended rehabilitation training at Silver Linings in Delhi, which works on empowering visually impaired girls, promoting inclusive education for blind children and overall inclusion of persons with disabilities into the mainstream. A few months later, Anshula’s family was happy to report the progress in their daughter to the Eyeway counselor. As a result of the training at Silver Linings, Anshula can now independently take a bath, eat her meals, clean her dishes, and perform other such daily activities. As part of her mobility training she has learnt to move around with a white cane. Eyeway also followed up the case with Silver Linings and learnt that in the next stage of training, Anshula will be taught basic computer skills, Braille and also how to cook. In addition, the counselor also advised Anshula’s family to support her closely through this transition and engage her in active discussions on topics of her interest. This would help her learn about new things and improve her communication skills.